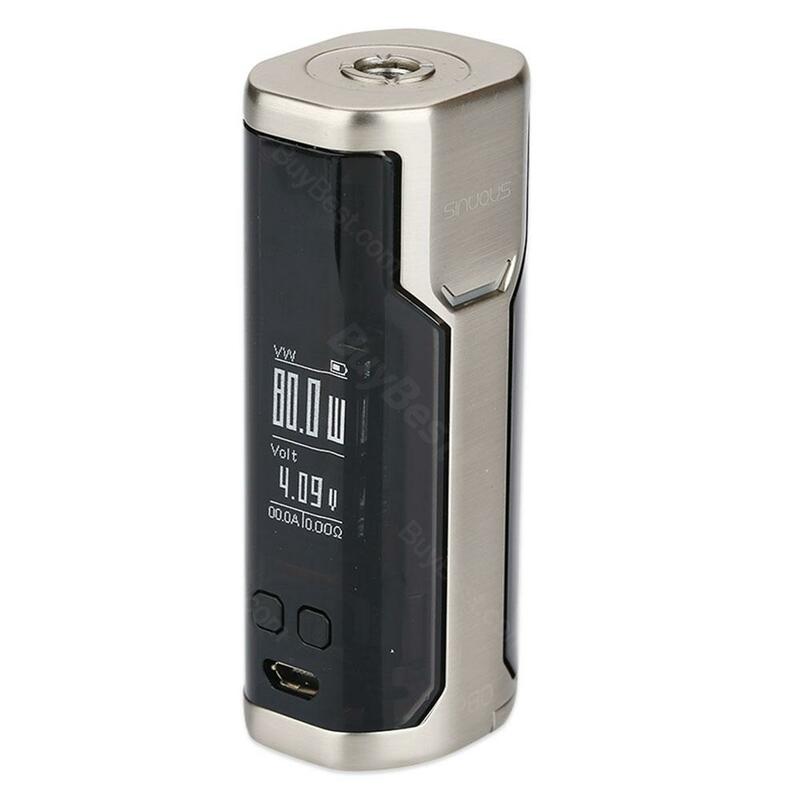 WISMEC SINUOUS P80 is a portable single 18650 box mod with maximum 80W output. It supports VW/ TC (Ni/Ti/SS) /TCR/ Bypass modes, which will satisfy different vaping needs. It has a hidden fire button and side 0.96-inch OLED display. With a centered 510 spring loaded connector, the SINOUS P80 can hold tanks up to 25mm diameter. WISMEC SINUOUS P80 TC Mod is a new flagship box mod that is capable of running up to 80W power with a single extra 18650 battery. It has a comfortable hidden fire button and a big 0.96-inch OLED display. A centered 510 spring loaded connector can hold atomizers up to 25mm diameter. The SINUOUS P80 MOD supports maximum 2A fast charging and firmware upgrading. With advanced dual circuit protection and reverse polarity protection, you will have a safer vaping with the SINUOUS P80. • It is compatible with ELABO mini. The mod is small and compact. The sleek design is really stylish and on the go it’s fantastic as it fits into my pocket. It comes with all the functionality I need and the wattage mode really delivers on par with some of the best out there. It’s ideal for my RTA’s and single coil RDA’s which look great on it. I find no compromise in performance from the time I’ve used it and would highly recommend it without a shadow of a doubt. Fantastic device, i love it! Zuverlässiger kleiner Akkuträger für unterwegs, mein zweiter schwarzer P80 funktioniert nun schon über 1 Jahr ohne Probleme. Klare Empfehlung !!! Thank you. Have a Good luck! Очень хороший удобный мод на один аккумулятор WISMEC Р80 на 80ватт. Amazing product, the size is perfect and it's 80w of power are just what I need. The delivery time (as always) was so fast and without a single damage. Great little single battery mod perfect for MTL. Pros: Good battery life, Arctic Fox can be installed. Cons: Battery door are a little clunky. Great device, i love it! Excellent quality, small but good lookingvape mod, I recommend. There are many functions, but simple to use! Good ergonomics! The comfortable in my hand, and large enough for gravity! High-quality products! The disassembly is simple, the battery fits very well! The display shows a lot of information, but it can be read. WISMEC SINUOUS уточенный и компактный, удобно лежит на руке. Excellent quality, small but good looking, I recommend. The high performance of this mod definitely is worth the money I spend on it.